Jake Gyllanhaal is giving the action genre another go with his latest film “Source Code,” a sci-fi thriller about a soldier who wakes up in the body of an unknown man and discovers he’s part of a mission to find a bomber of a Chicago commuter train. Unfortunately, audiences didn’t take to Gyllanhaal’s first action attempt — Disney’s “Prince of Persia: The Sands of Time.” The $200 million production has yet to break even. 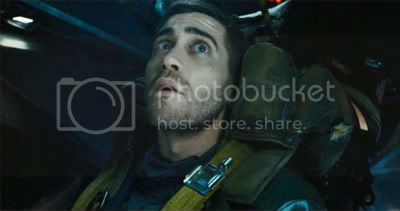 However, “Source Code,” directed by Duncan Jones, cost only $35 million to produce and should attract a wider audience. Below is a clip of Jake’s character Colter Stevens, speaking to Carol Goodwin (Vera Farmiga). In it, Goodwin informs Stevens he must stop a target from bombing Downtown Chicago. Jeffrey Wright, whose character remains nameless, adds his two cents about possible casualties, unfathomable in number, should Stevens fail. Am I the only one not feeling a sense of urgency here? Granted, 44 seconds probably isn’t enough time to establish any. Besides that, from what was previewed, I feel as if I’ve seen this before. However, since I really enjoyed the BAFTA award-winning “Moon,” I shouldn’t judge “Source Code” too harshly from the very brief preview. Chances are Duncan Jones’ latest could turn out to be a very good sci-fi film. So, will you be watching “Source Code” in theaters, or is it a rental? Sound off to the right!